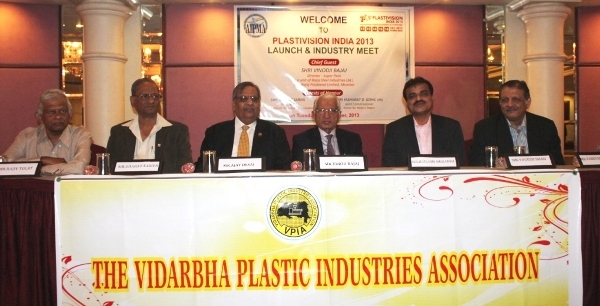 Increasing demand from various sectors such as agriculture, automobile, engineering, packaging, infrastructure and healthcare, Indian plastics industry is likely to witness a substantial growth in investment in new technologies, according to The All India Plastics Manufacturers’ Association (AIPMA) – the organiser of Plastivision India 2013 to be held in Mumbai from December 12-16, 2013. With growing concern for environment, the market for biodegradable plastics is expected to increase in future, thus leading to rise in demand for biodegradable masterbatches – a key additive that is added to plastics to help it decompose in environment. “At present, biodegradable masterbatches are imported in India. But, with rise in demand, one can expect these masterbatches to be manufactured in India,” said Raju Desai, Chairman, Plastivision 2013, on the sidelines of a recently held press conference in Mumbai. ALSO READ: Plastics industry to witness investments of $10 billion in next five years: PlastindiaWith big corporates like Coca-Cola, Pepsi, Reliance Industries, etc taking proactive steps to recycle plastics waste, plastics recycling segment is expected to witness huge investments in near future. “We would like to contribute our share to the society and propagate that plastic is not bad, but it is waste management that needs to be paid attention to. Hence, we have also undertaken several initiatives nationally for recycling of plastics,” said Desai. In fact, at Plastivision India 2013, we would be demonstrating successfully that usage of plastics is actually taking a load off our precious non-renewable resources and help the environment, he added. AIPMA estimates that the plastic consumption will increase to 20 million tonnes a year in 2020 from the current 8 million tonnes a year in India. “Plastics is one of the biggest contributor to India’s GDP with the growth rate of 12%-15% per annum, it houses over 50,000 manufacturers and employees of over 40 lakh workers in the plastics industry. Apart from covering the plastic industry comprehensively at Plastivision India 2013, our aim is to highlight the demands with the government and motivate policy changes that better the growth of the industry. We appeal for Technology Upgradation Fund (TUF) like status for the plastic industry from the government,” said Anand Oza, President, AIPMA. He further added that AIPMA has also appealed to the government for special Plastic Parks across India that would help the industry to flourish more. AIPMA envisages an additional investment of Rs 25,000 crores including SMEs which will help the industry in a big way. Currently plastic parks are taking shape in Northern India (at Panipat Haryana and north Rajasthan); Gujarat (at Dahej and Sanand); Karnataka (at Narasapura Industrial Area, Harohalli); and Kerala. Plastivision India 2013 would provide an opportunity to all stake holders to view into the kaleidoscope of growth prospects of plastic industry. The 5-day event, which would be attended by over 1500 exhibitors from 30 countries, will have dedicated pavilions like Indiamold, Plastiworld, Plastics In Agriculture, Automation & Robotics in Plastics Pavilion, Green Pavilion, Solar Energy Pavilion and Plastics in Medical Pavilion.